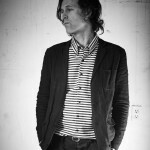 It’s been quite awhile since we’ve heard anything from Jason Collett after the quiet release of his 2010 album Rat a Tat Tat. Jason is delighting his fans this year with the release of two new albums later this fall. The first is a brand new LP entitled Reckon while the second is a greatest hits of sorts LP entitled Essential Cuts. Both of these new albums will be available on September 25th via Arts & Crafts Records. A preview of the new material can be found below and is entitled “I Wanna Rob a Bank”.